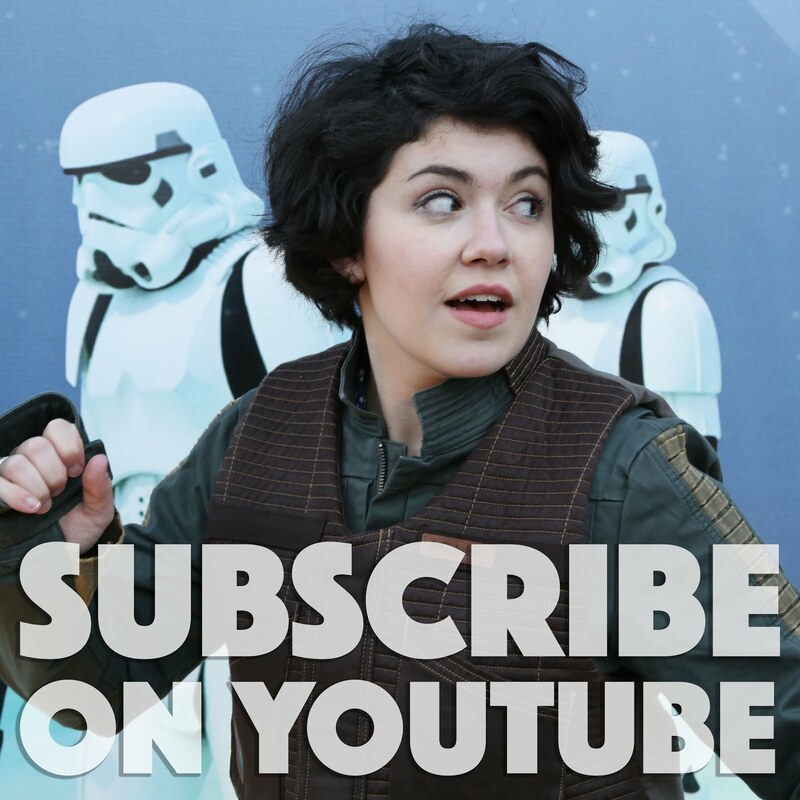 Get excited, guys. 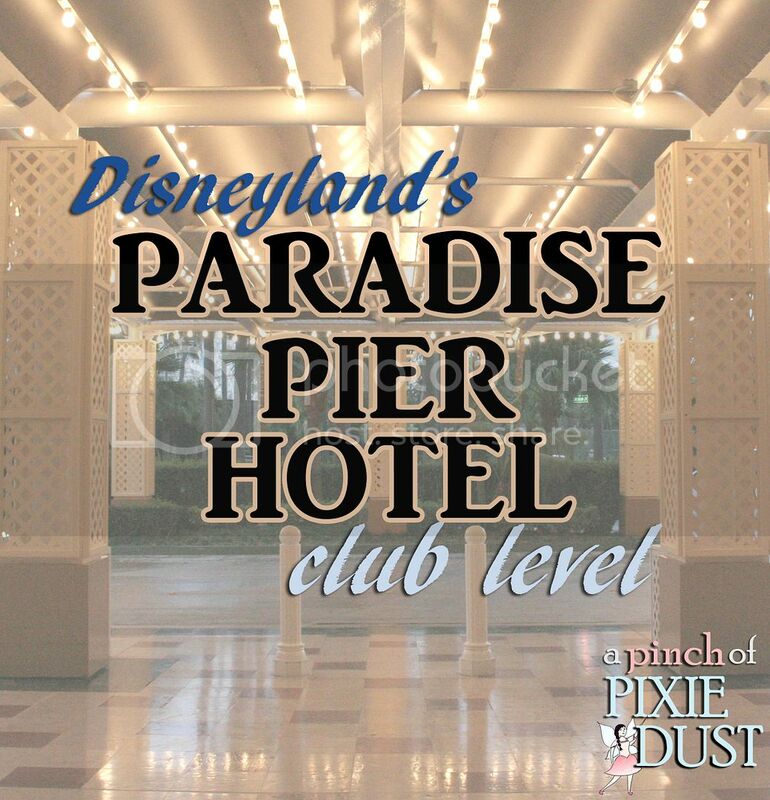 I have some Disneyland Club Level pixie dust to share today! 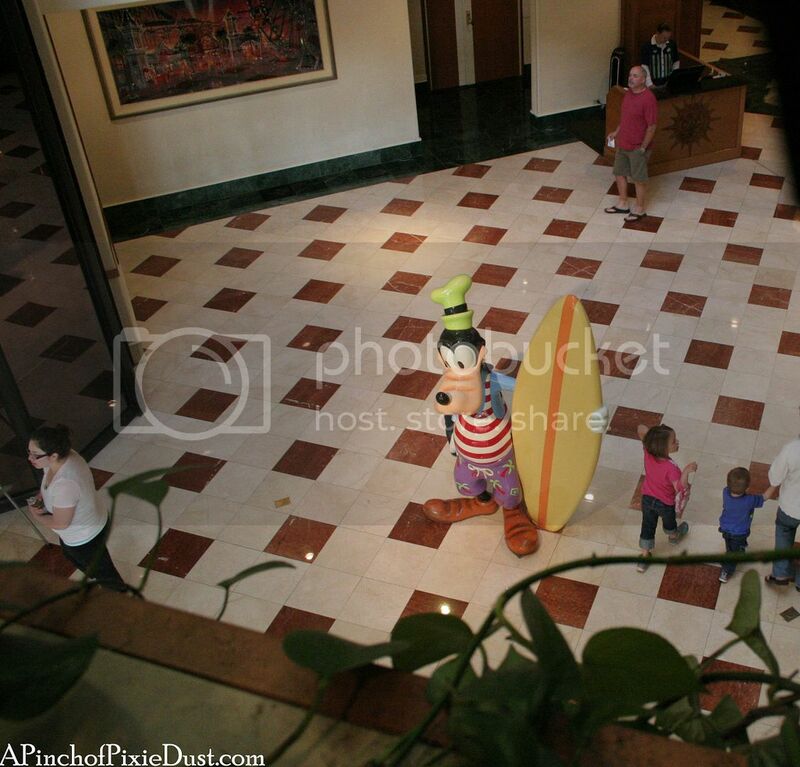 We stayed two nights at the Beach Comber Club at the Paradise Pier Hotel on our recent trip to Disneyland, and it was so much fun. 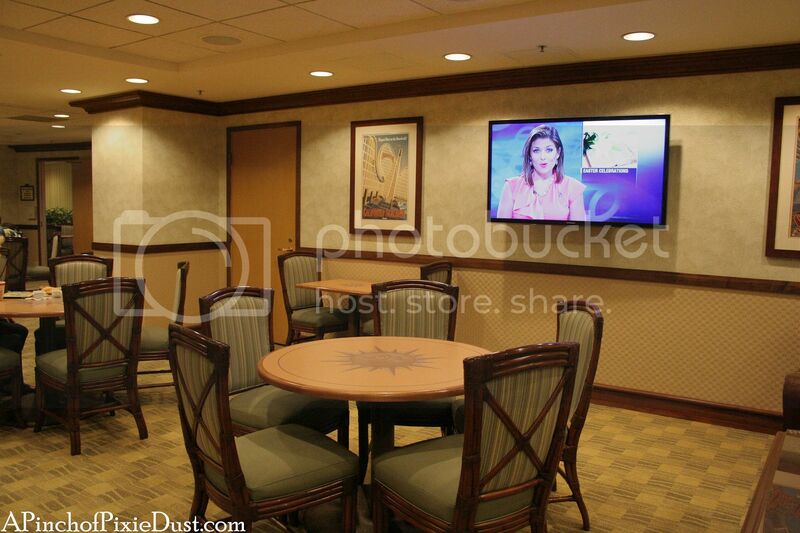 We love staying club level at the Walt Disney World resorts and enjoying the cozy lounges and tasty food offerings, so it was extra fun to experience concierge at a Disneyland hotel! 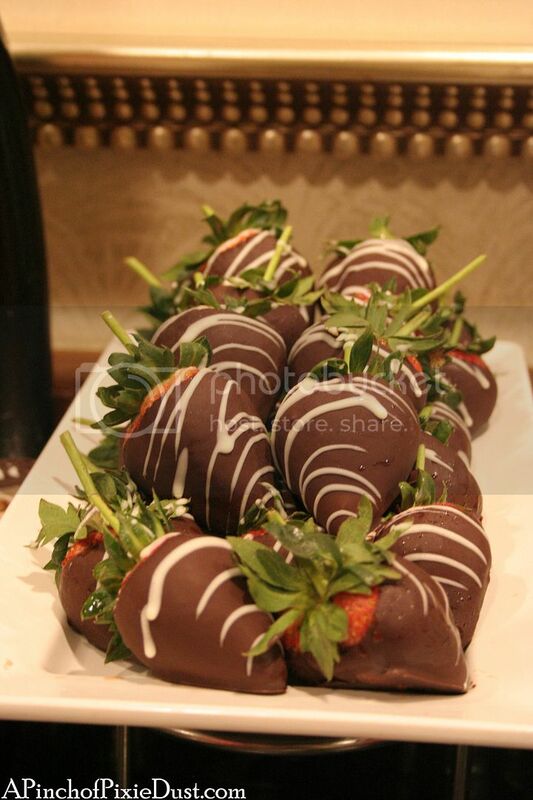 They had the largest chocolate-covered strawberries I have ever seen. But let's begin at the beginning! 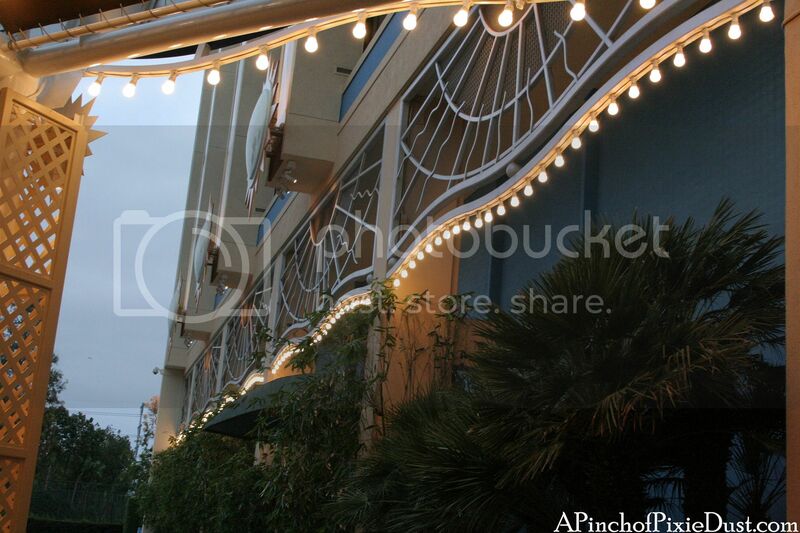 The Paradise Pier is a boardwalk-themed hotel...I loved the bright lights of the port cochere. 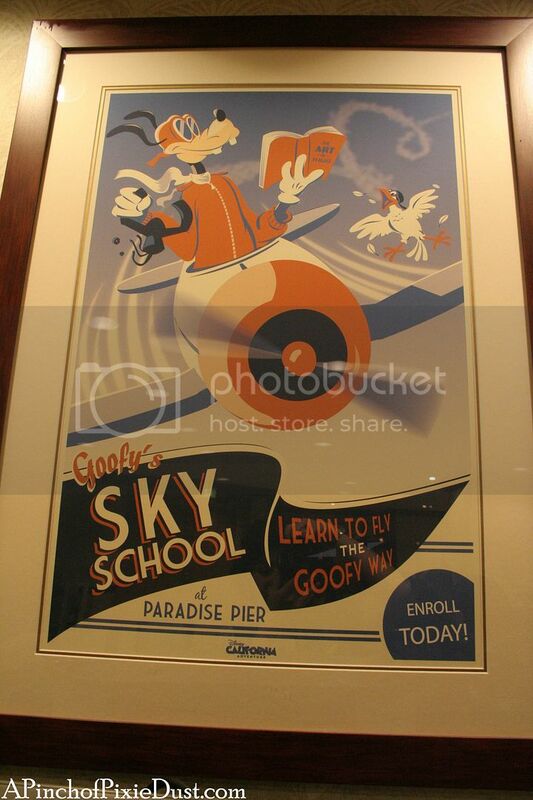 Goofy is ready to greet you when you enter the front doors - and the view looking up at all the floors is pretty cool! 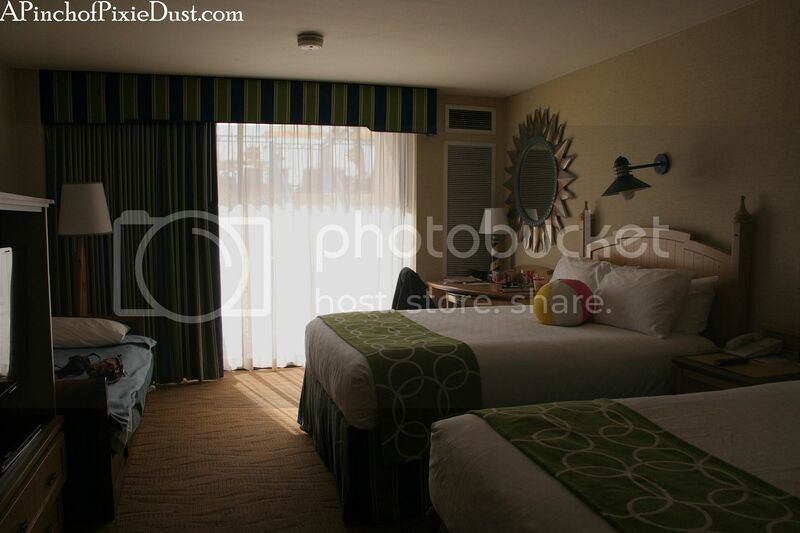 See those green plants in the lower left hand corner of the picture on the right? The second floor is enclosed by the glass roof and looks out over the atrium - and part of the area belongs to the club lounge! There are tables and chairs behind those plants, where Athos is photobombing. 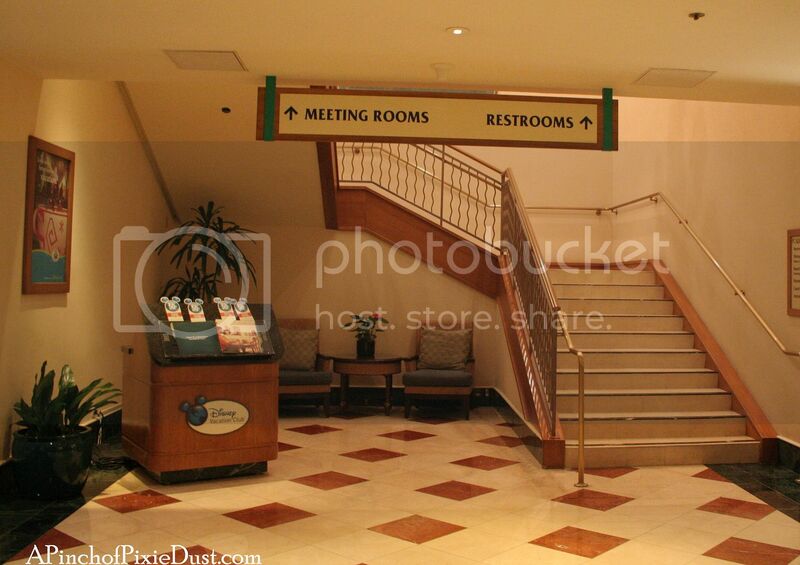 At many Disney World club levels, you'll be taken upstairs by a curbside cast member to check in in the lounge. At the Paradise Pier we were checked in in the lobby and didn't see any curbside CM's (not sure if this was because it was later in the day?). 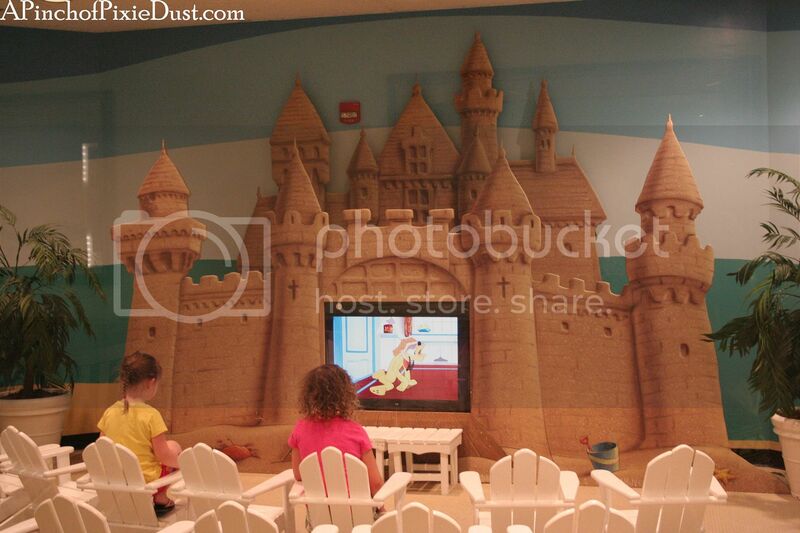 Although...it does have a pretty fun kid's area...how cute is that sandcastle Sleeping Beauty castle? Athos wants you to know that the cartoon channel has the classic, unabridged version of the cartoons - not the modern "Have a Laugh" incarnations that now play at Disney World. Because these are the kind of things Athos notices. The third floor has the pool and also many of the club rooms - we had one of the ones with a blue gate and patio area, so fun! 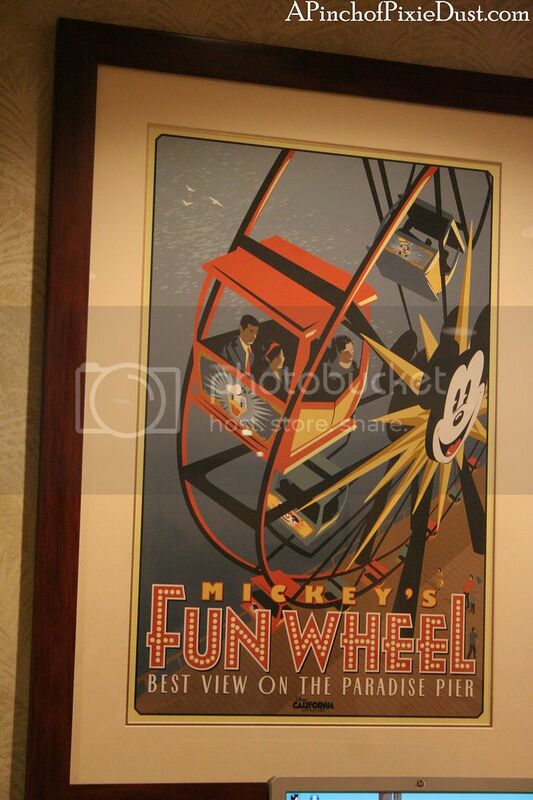 Club level rooms at the Paradise Pier are either on the third or fourteenth floors. A room on the fourteenth floor looking out over Disney's California Adventure park would have been fun too - you can see World of Color from up there! I went up and watched from the hallway one night. 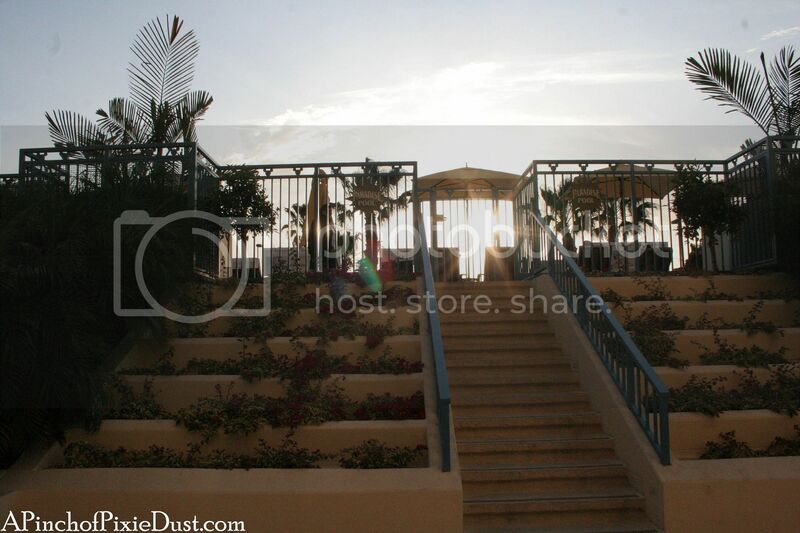 I really loved our room - it looked out at this tiered, landscaped wall, and the pool was just up those steps! 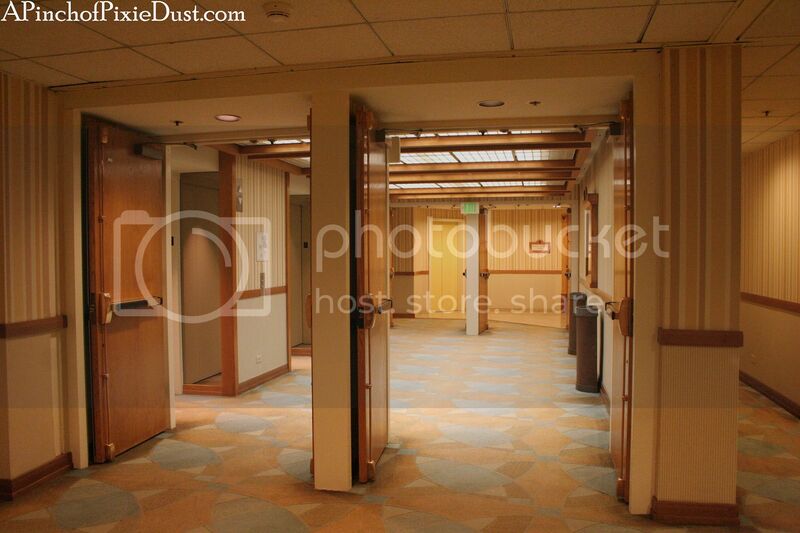 I somehow didn't get a photo of the door, but you can see it in the vlog...and to be honest, it was a pretty ordinary door. 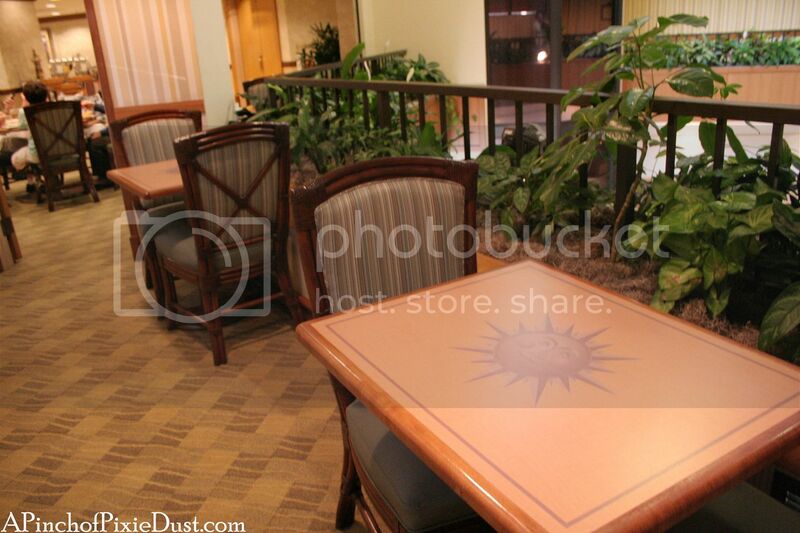 The lounge was pretty and spacious, though not quite as striking as other disney club lounges. 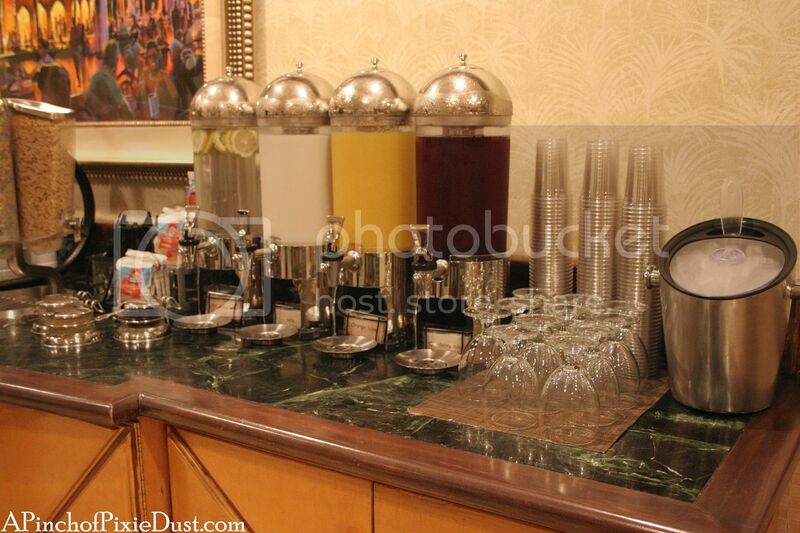 There was a concierge desk just to your right when you entered, and beyond that was the buffet with the food offerings. 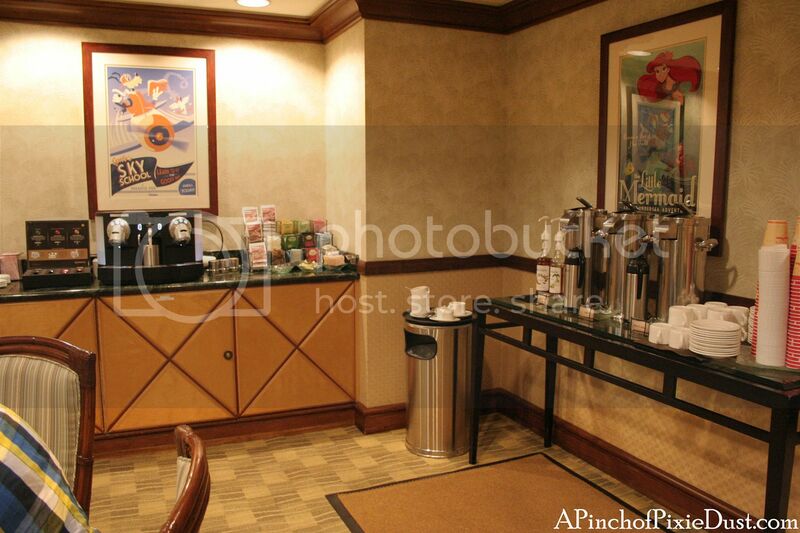 The coffee station was off in the corner to the left. I LOVE CLUB COFFEE. 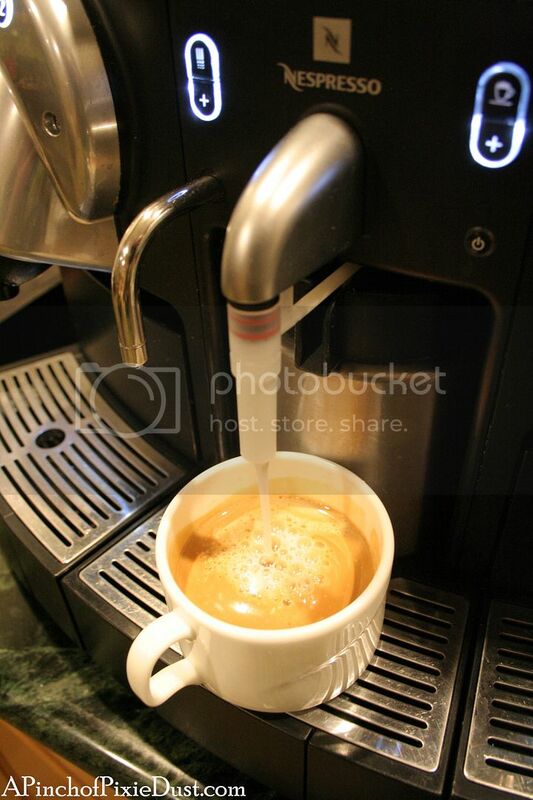 They had the same nespresso machine that the WDW club levels have...with that lovely button for steamed milk. Yum. 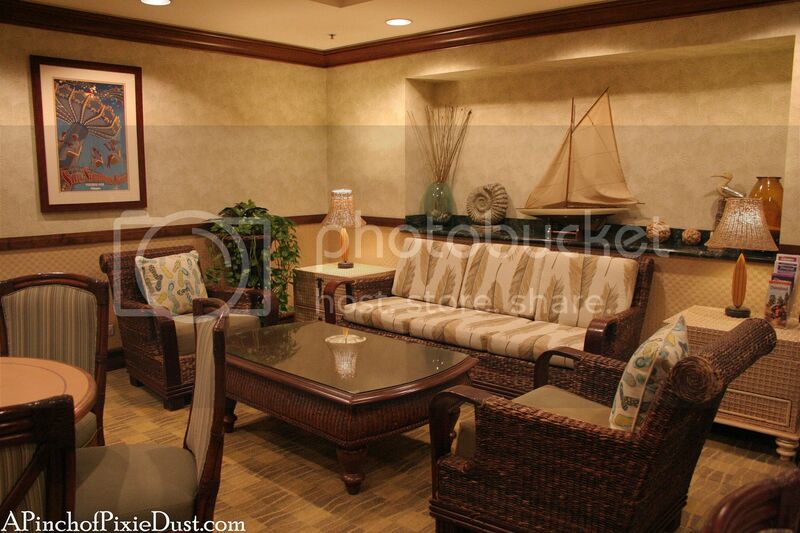 There was one sofa seating area. Athos would like to tell you that the ammonite next to the sailing ship is not a real fossil. 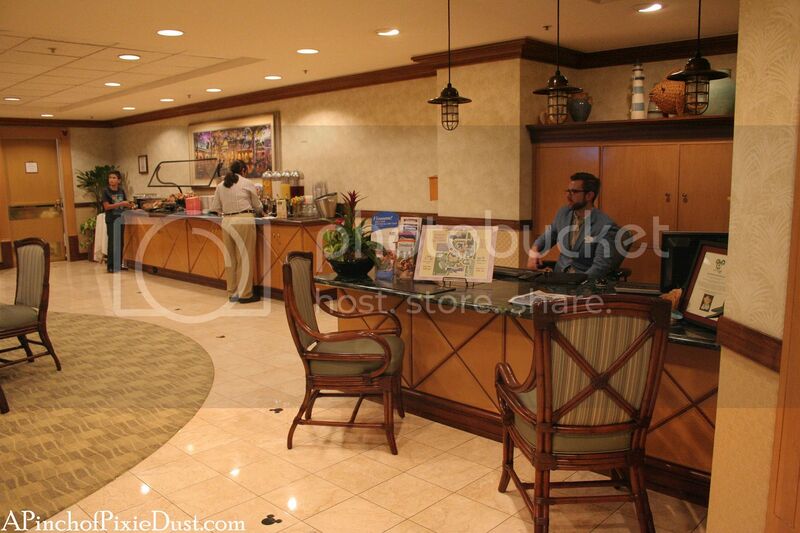 The Grand Floridian club level has an ammonite which Athos believes is real. I know. Athos needs to stop hijacking this post. Plenty of tables and a tv...often they had Disney movies playing like Brave and Ratatouille, which I thought was so fun - and so much nicer than the news! 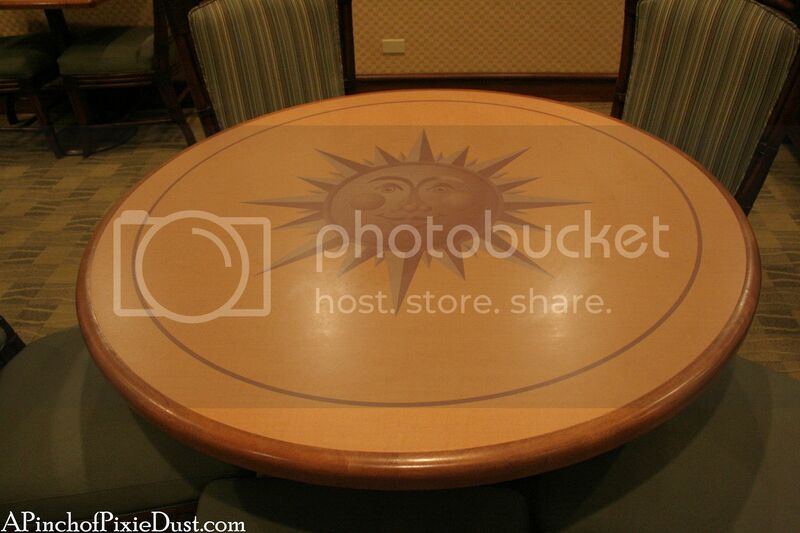 The tables have that cheerful Paradise Pier sun on them! 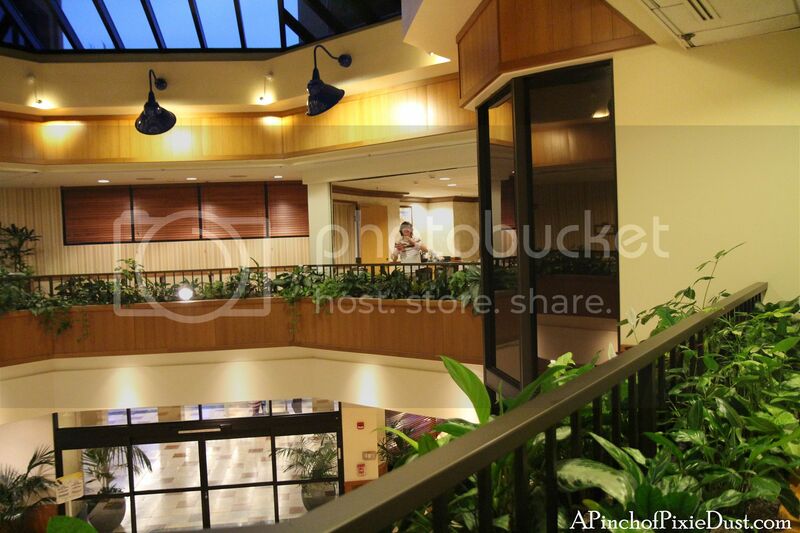 Here's a picture taken from that area overlooking the atrium I mentioned earlier - it was a sort-of wing off of the main club lounge room. Looking down on Surfer Goof. A few club lounge details...loved that they had a computer for guest use (and just check out that phone!). The hotel did have wifi - the parks, interestingly, did not. 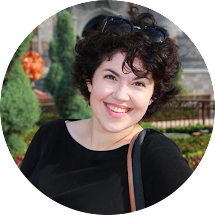 It was a bit of a shock - I've gotten so used to the free wifi at Disney World! 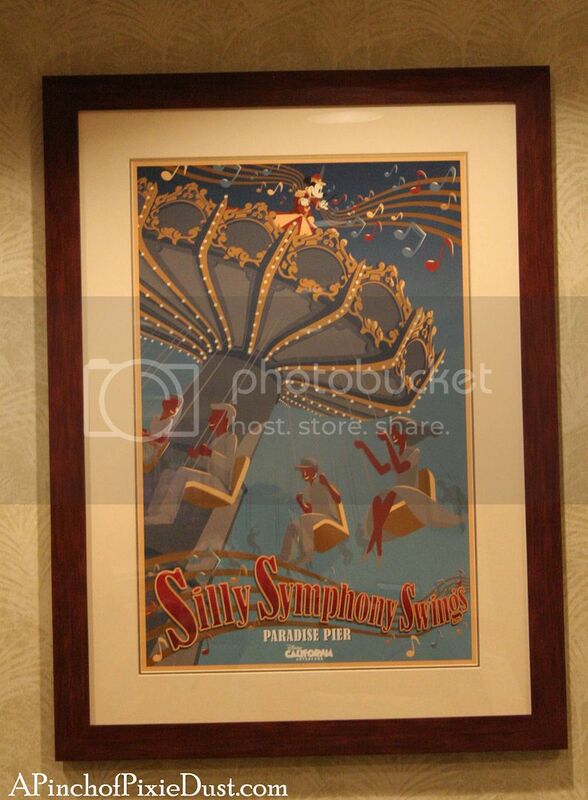 I loved all the attraction posters from Disney's California Adventure on the walls! 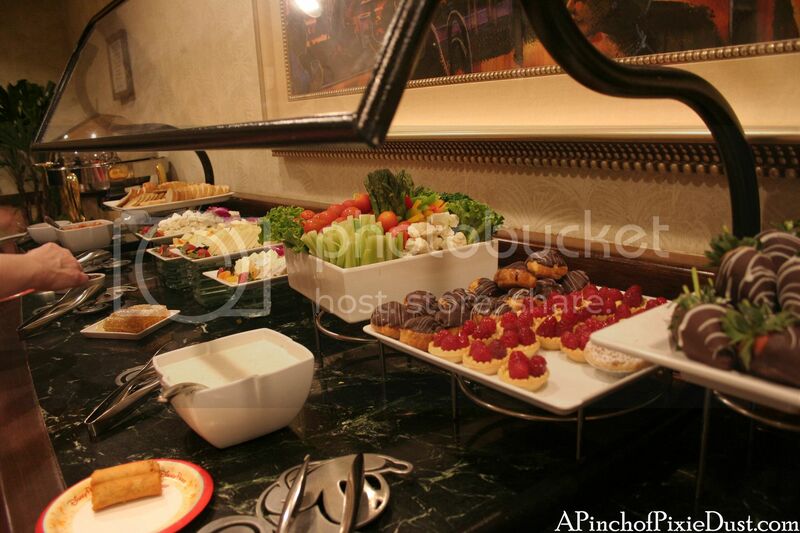 Let's get over to the buffet and have a look at the food, shall we? 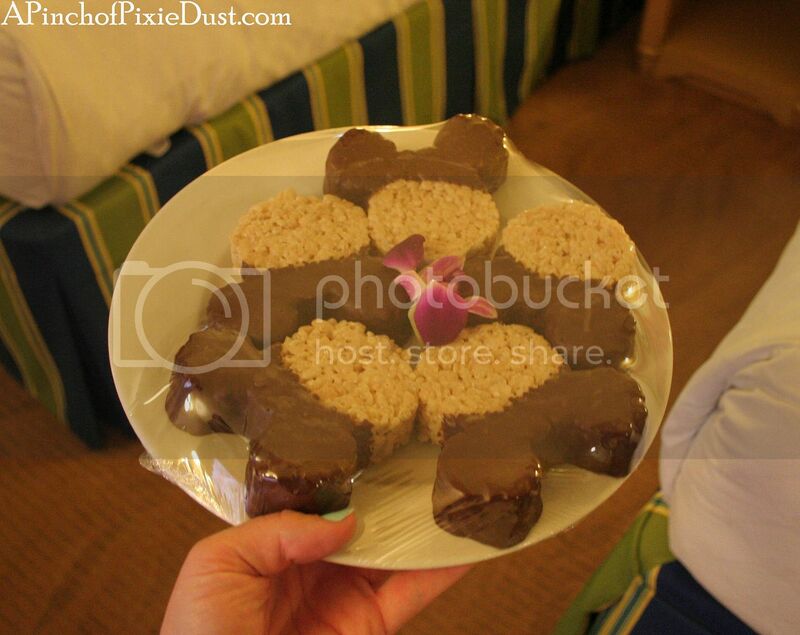 I love the Mickey heads that the tongs were resting on! 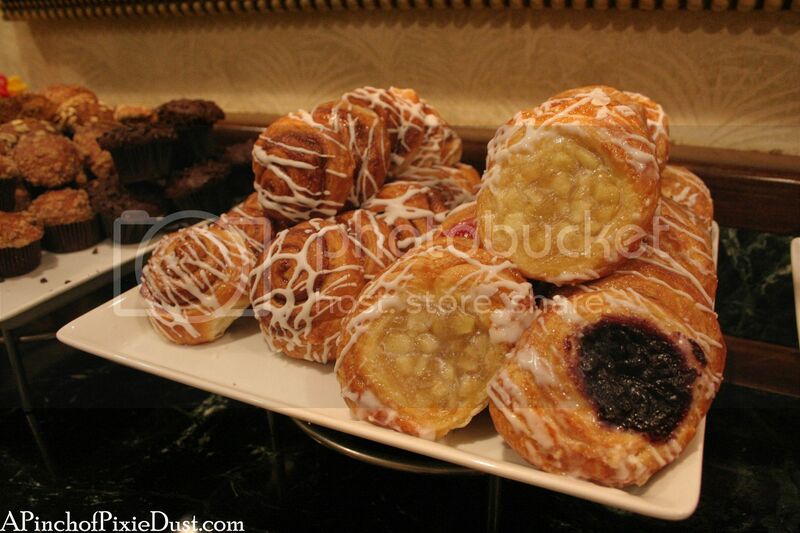 I was sadly not impressed with these pastries - they were dry and ordinary. 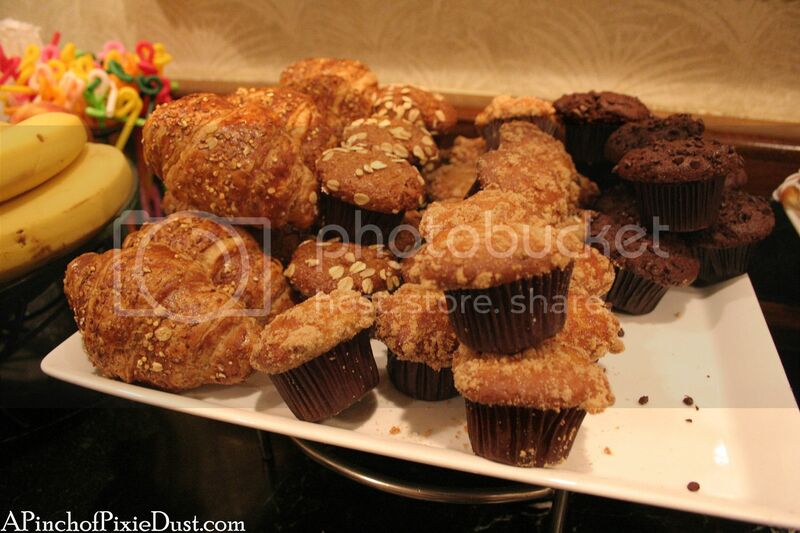 Those chocolate muffins were nothing like the amazing ones at the Kilimanjaro Club. 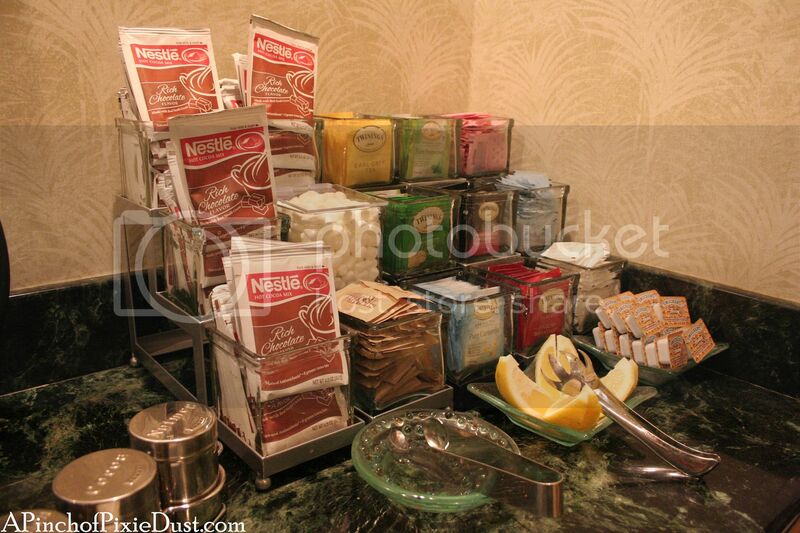 ...and don't forget the hot chocolate and tea! Breakfast started at 6:30 and went to 10. Both mornings we went at 6:30 to get over to the parks for early opening at 7:00. 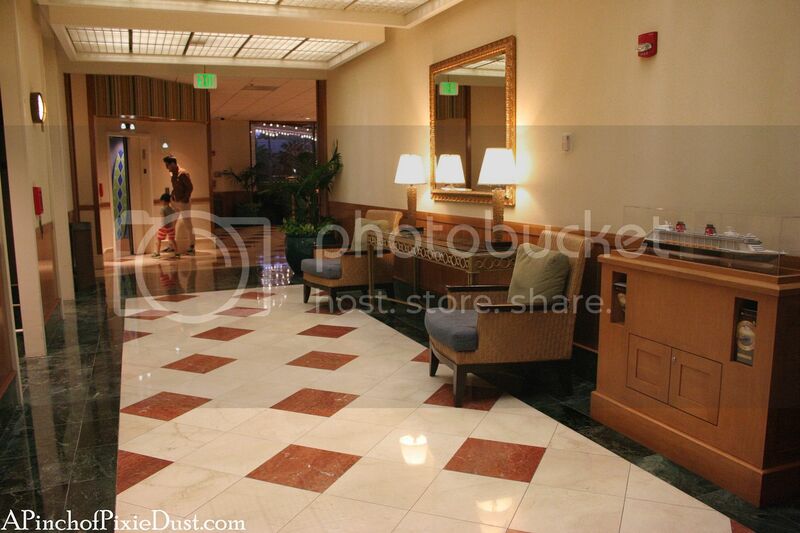 That was one huge perk of being a guest at a Disneyland hotel - you got to use the extra magic hour. 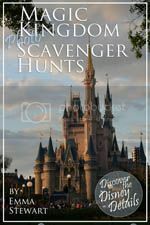 The parks were SO QUIET for that first hour - way quieter than extra magic hours at Disney World. 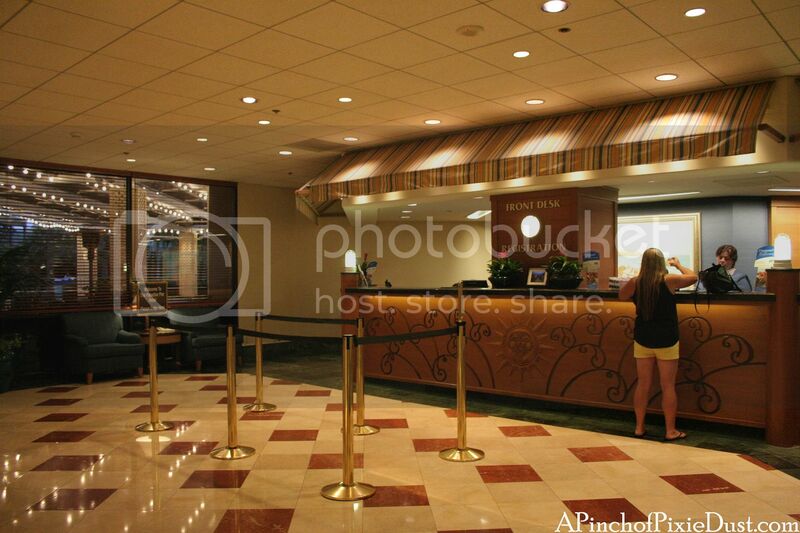 Probably because there are only three Disneyland hotels compared to over 25 hotels at Disney World! Lovely breads and cheeses. See that golden brick in the foreground? That was a honeycomb with honey! 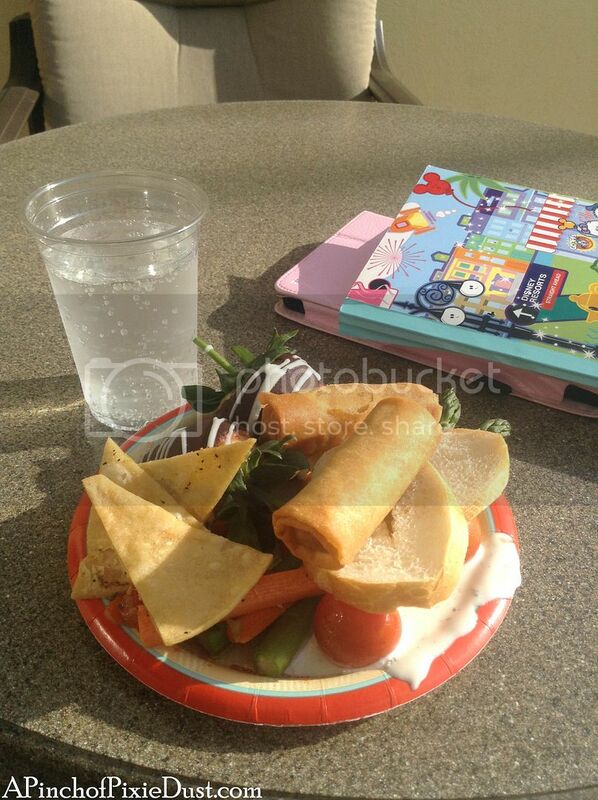 One of the cast members suggested we get a slice of bread with cheese and drizzle the honey over top - it was delish. 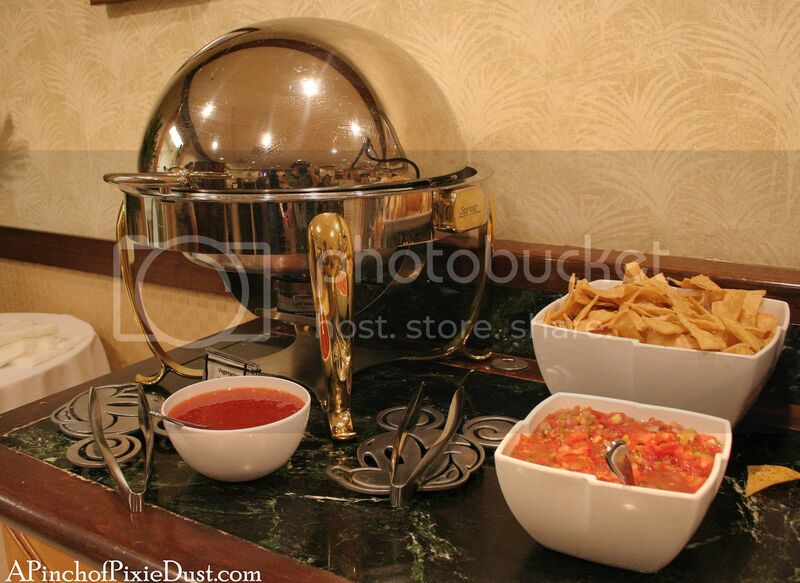 Down at the end you would find chips (SUCH GOOD CHIPS), salsa, and a hot offering. 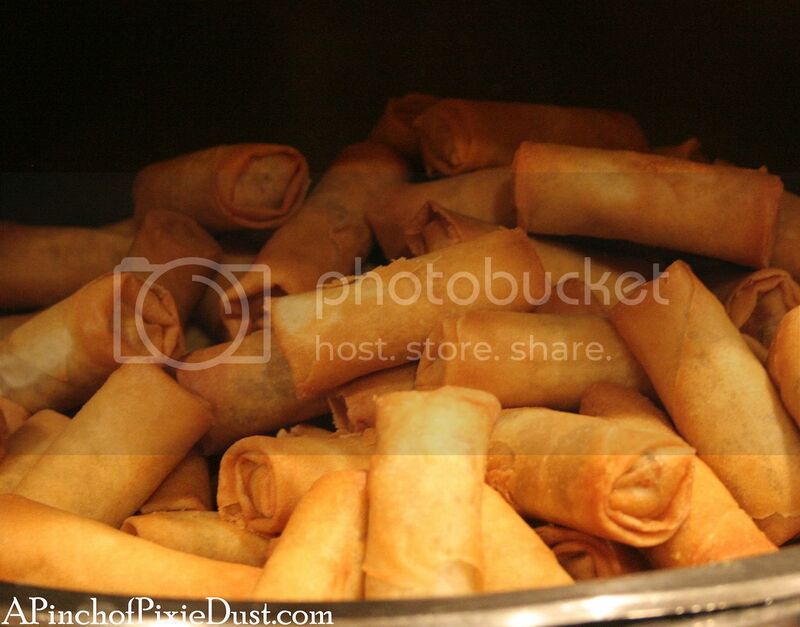 On our first night there were spring rolls, and on the second there were mini empanadas. Both were yummy! Guys. I don't think I've ever seen veggies look this beautiful. 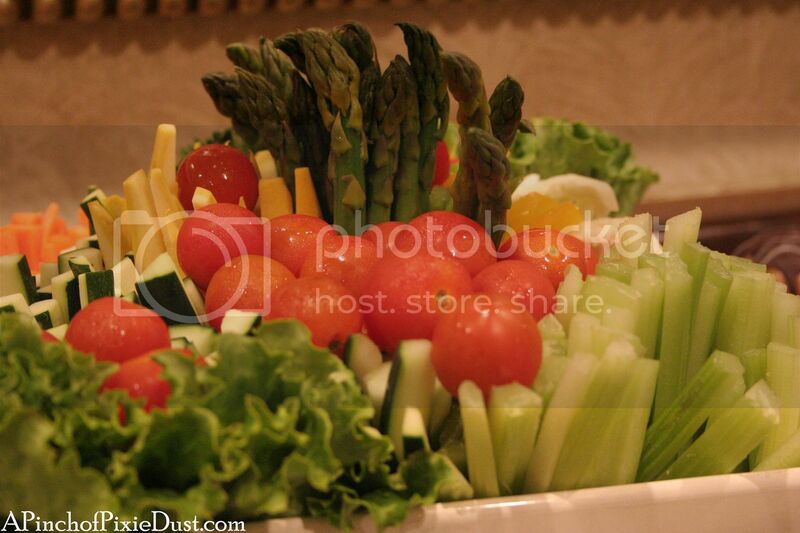 It's a crudite bouquet. My dinner - nom nom. Also. 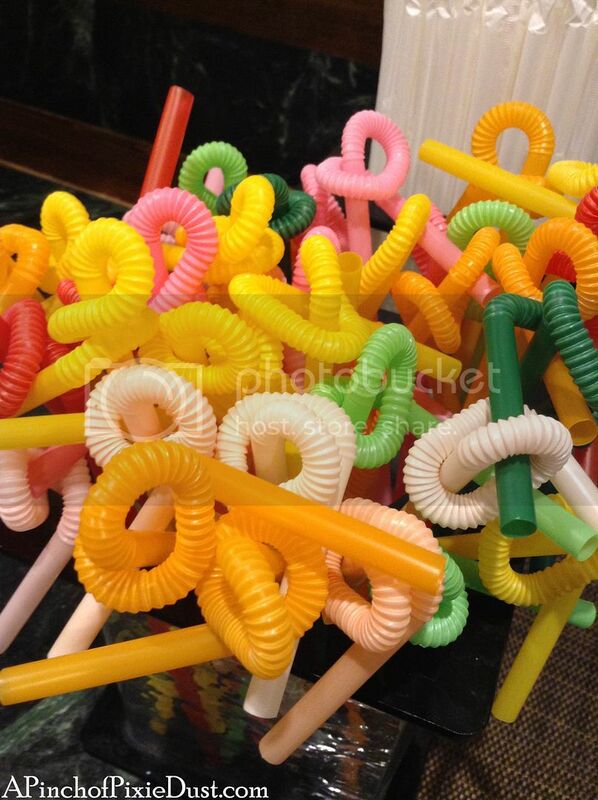 There were twisty straws in fantastic colors. LOVE. The hot appetizer changed each night, but everything else was the same, including the desserts. 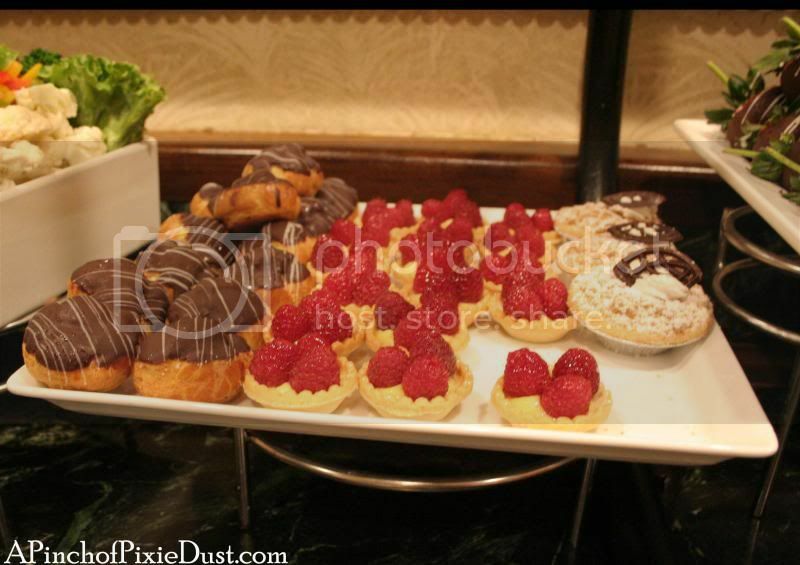 There were cream puffs, fruit tarts, and tiny apple tarts (far right). 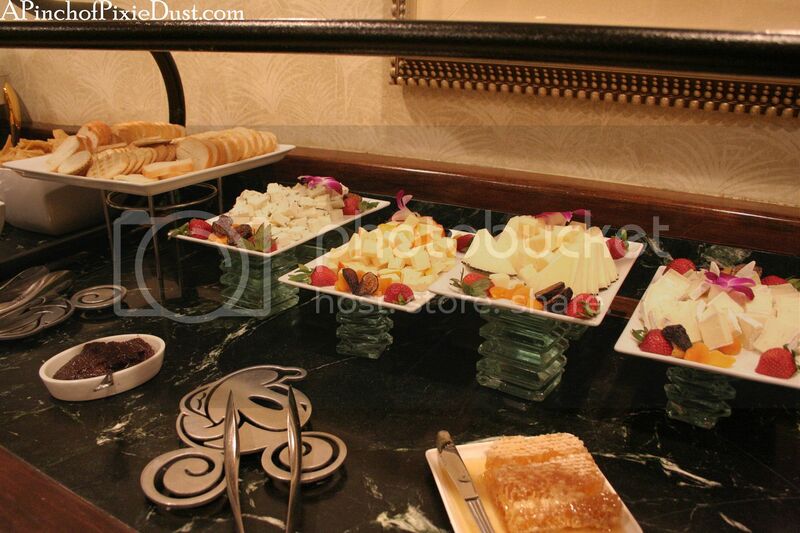 The interesting thing at the Beach Comber Club was that the desserts were put out at the same time as the dinner appetizers. Then at 7 pm they would take away the savory things and leave the sweets. It was nice not to have to wait for the desserts...but a little less exciting somehow. 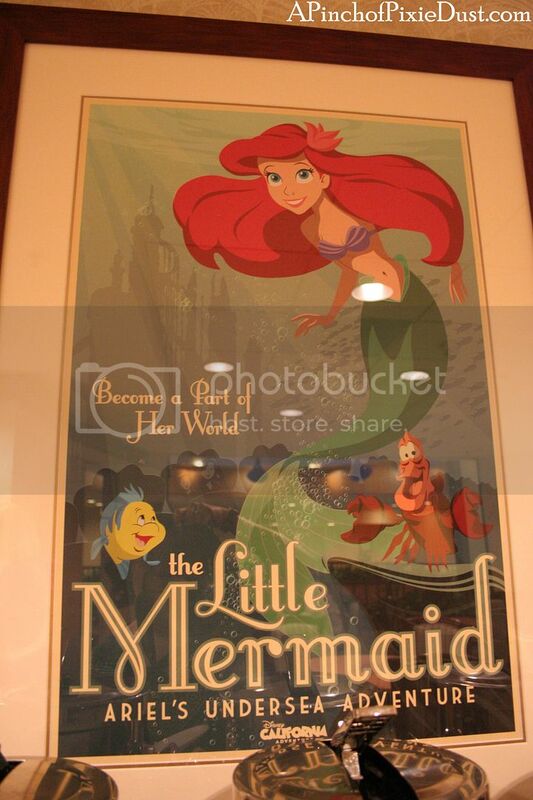 It's impossible not to compare our Disneyland club level experience with our Disney World club level experiences, and while we did really enjoy the Beach Comber Club, it didn't have quite the same level of magic. 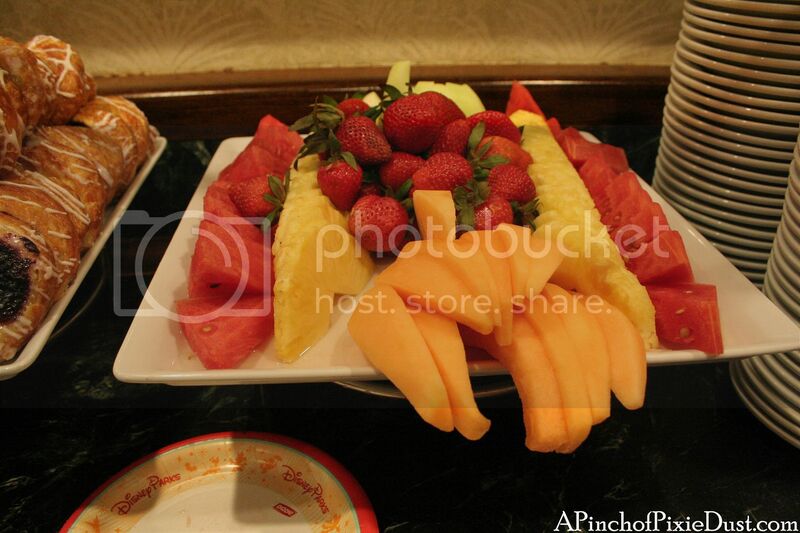 At WDW clubs you'll find more variety in the evening appetizers - they change more from day to day. 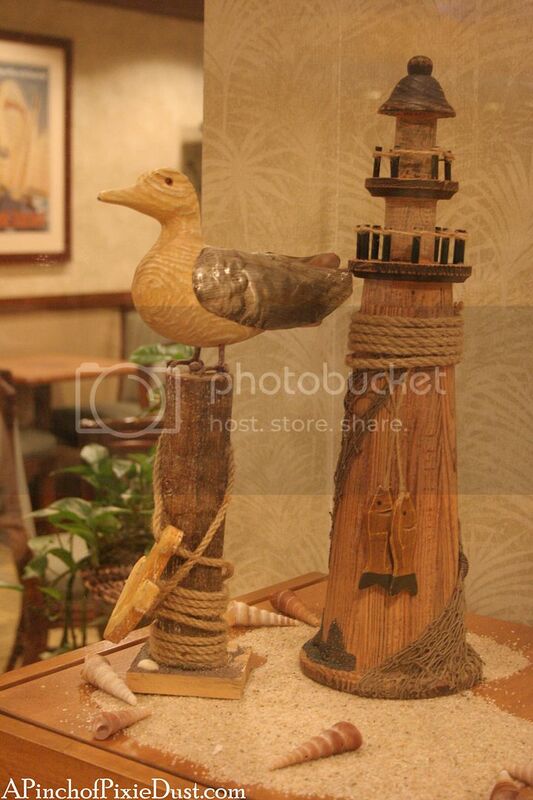 And the Paradise Pier's lounge area, while nice, just can't compare to the Polynesian or the Contemporary with their views of the castle. 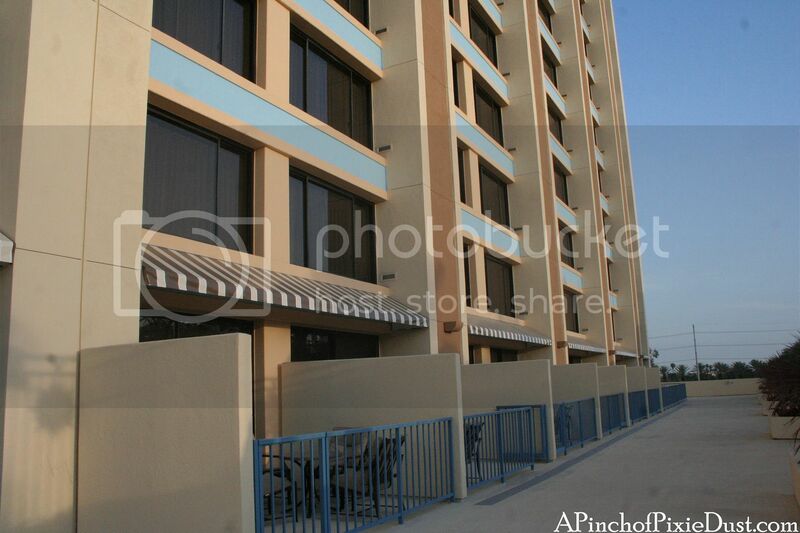 What are your thoughts on the Beach Comber Club? 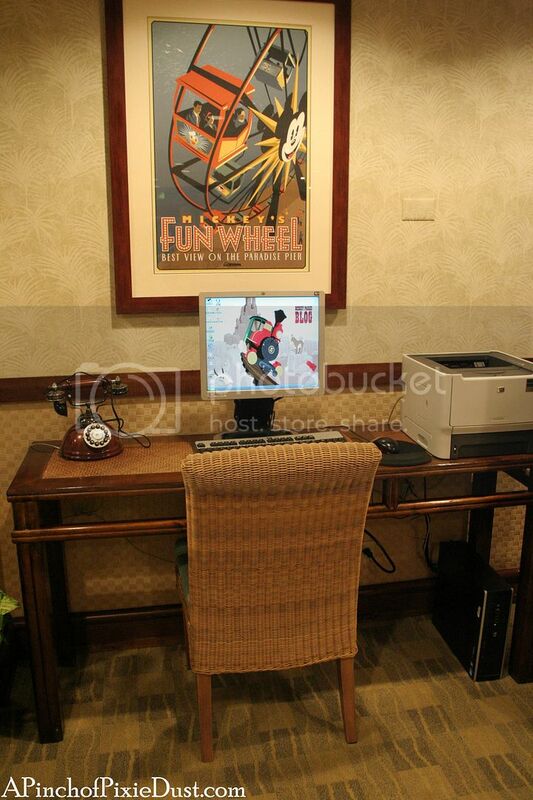 Have you ever stayed at a Disneyland club level? 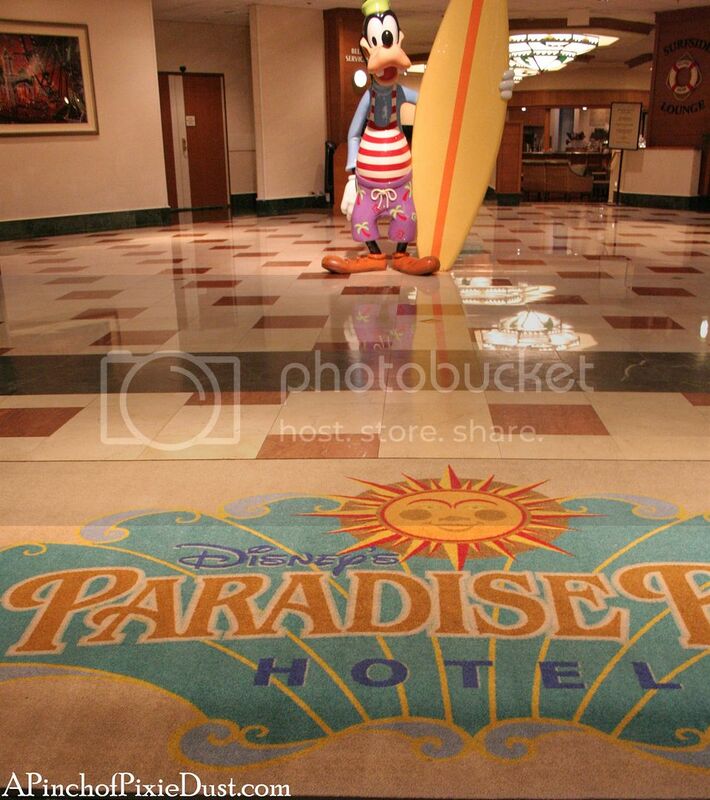 Just booked a stay at the Paradise Pier Hotel, club level. Thanks for the fantastic post! Excellent write up. 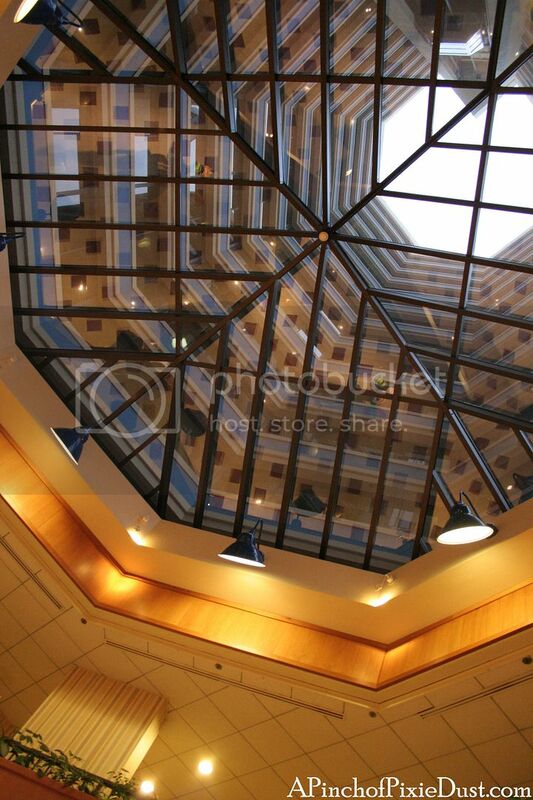 Thanks for all of the great photos! 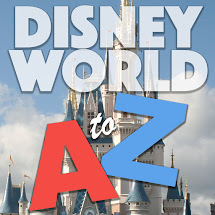 We're also Walt Disney World club afficionados, so I'm glad to find this comparison as we're doing a Disneyland add-on to our SoCal trip. I just got back and was highly disappointed. They have changed a lot. No chocolate covered strawberries. 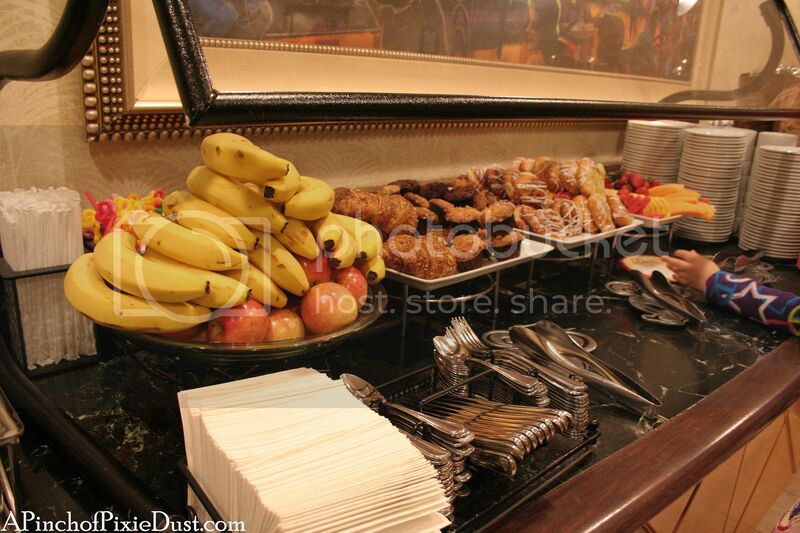 The breakfast left a lot to be desired. 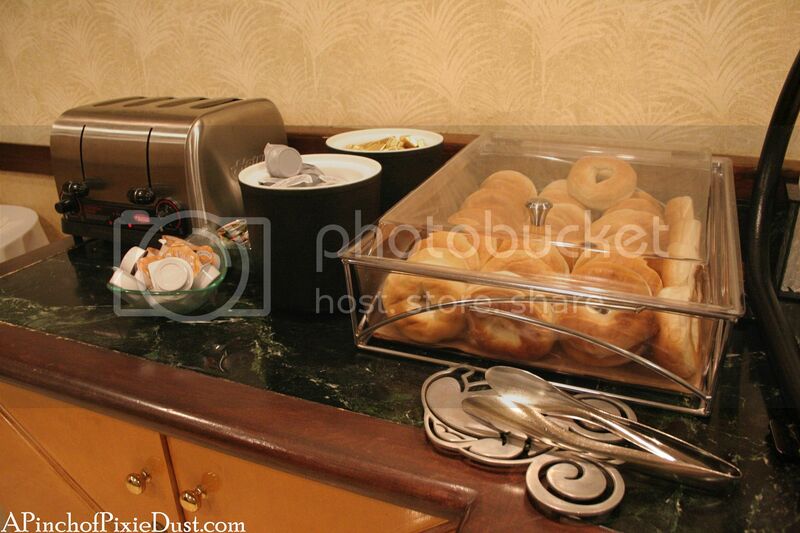 During the day the grab and go snacks was chips and cookies. In the evening they had one hit app that just was blah and cheese and crackers. Definitely not worth the extra money. The closing at 8pm was the worst part. Don't waste your money.